If you're looking for one of the best compact digital cameras, meet the outstanding COOLPIX P7800. Amaze yourself over and over again with breathtaking photos and Full HD 1080p videos -- tack-sharp detail, rich, vibrant colors, beautifully blurred backgrounds, dramatic lighting, soft, natural skin tones and so much more. 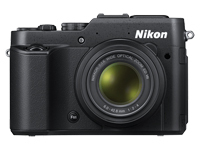 Its superb 7.1x Zoom NIKKOR ED glass lens gives you both wide-angle and telephoto capabilities and is engineered to match its extra-large 1/1.7" CMOS sensor. With an Auto Mode you can rely on, 19 Scene Modes for getting the most out of every shooting situation, creative in-camera Image Effects, complete PSAM control, RAW shooting, optional Wi-Fi connectivity and more, the COOLPIX P7800 will go as far as you want to go. For those who never settle for second best, COOLPIX P7800 delivers.